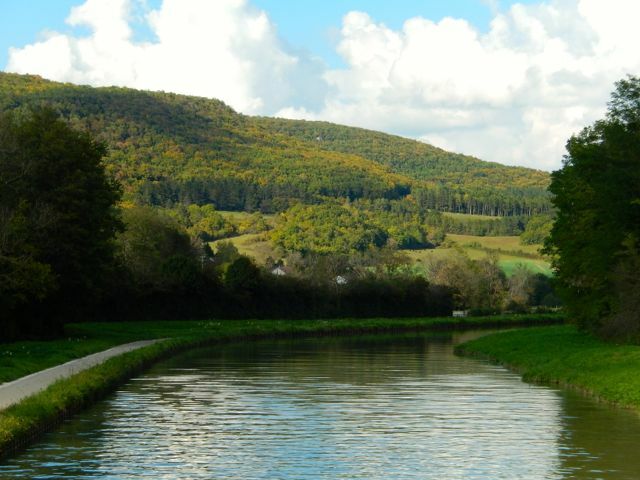 After an incredible tour of Provence it was time to show Louise and Neil what barging was like. Julian met us at the Dijon train station, and with some effort we jammed five people and all of our luggage into our little car for the forty-five minute drive to Vandenesse. The first thing we did was take Neil and Louise for a little hike up to Chateau Neuf for some crepes. After our yummy lunch we walked around the little village and then headed back down the road picking and eating wild blackberries the entire way. We climbed aboard Rabelo thinking we would take it easy after our outing. Lisa had gone ahead of me, and just as I was about to open the front door she began to shriek, “Oh no, oh no. 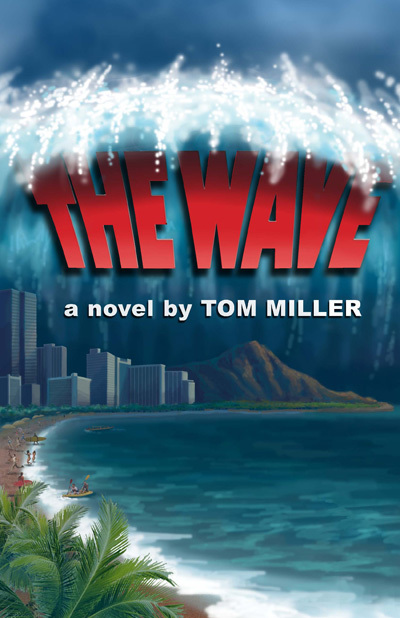 Tom, come quick. Hurry.” All I could think was what now? Had a light bulb burned out or was there a spider that needed killing? What possible catastrophe had she encountered? 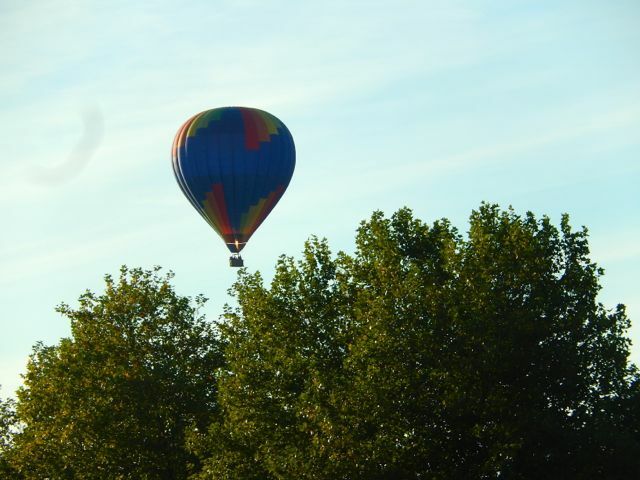 Unfortunately this time Lisa had good reason to be alarmed! The black water holding tank where all the waste from the toilets and showers go had backed up and overflowed through the guest toilet. 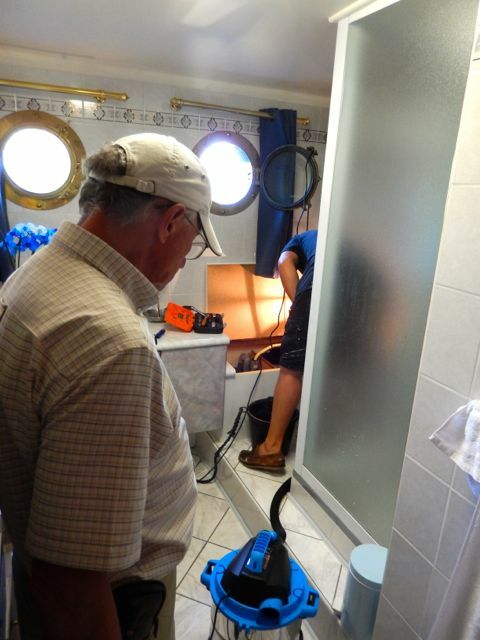 There was sewage running down the hall, through our dinning room and living room all the way to the back of the boat. The minute I saw what had happened, like any captain worth his salt, I abandoned ship. Just kidding. Lisa and Louise grabbed the cleaning supplies and went to work on the mess while Julian and Neil attacked the holding tank. Of course I provided supervision for the entire operation. Within a couple of hours everything was back the way it should be, and hopefully the holding tank repaired so we don’t have that problem again. We wanted to show Neil and Louise what barging was like, and did they get a not so savory taste! Neil, Louise, and Lisa taking in the view on the way to Chateauneuf. Neil and Julian working on the holding tank. 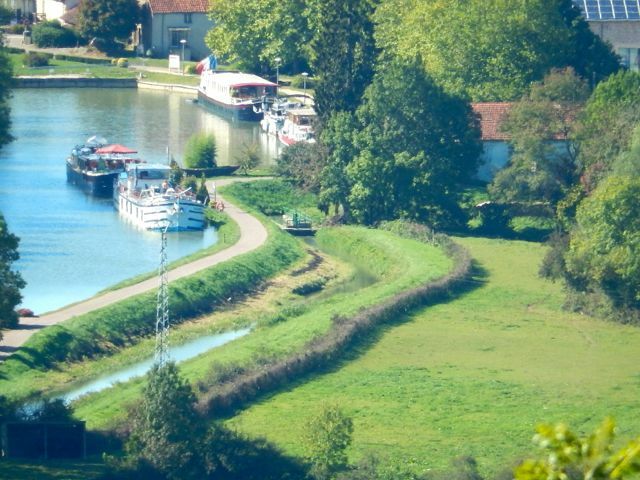 Taken from Chateauneuf, a picture of Rabelo moored in Vandenesse. After our little disaster it was time to offer up a real treat for our friends, so we took them to Guedelon. This is the modern day castle that is being built using medieval construction materials, tools, and techniques. 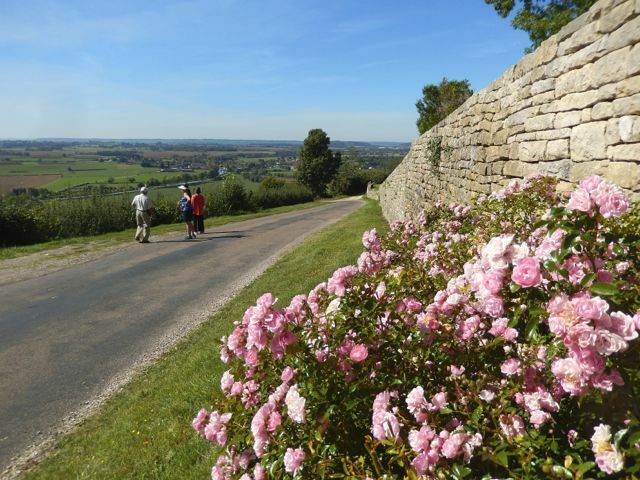 It is one of our favorite places to visit in France. 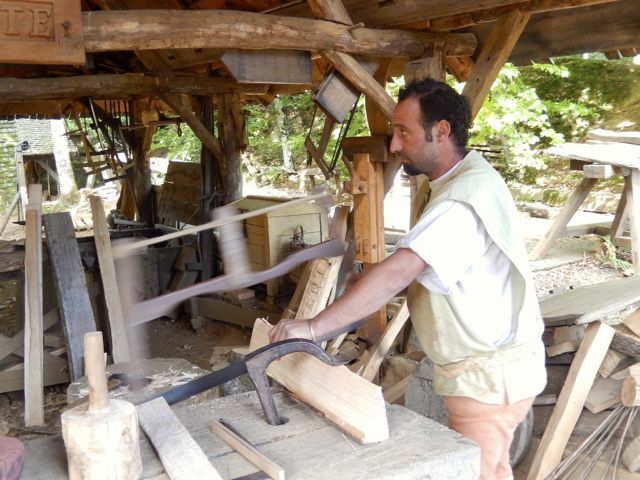 Even though we have been numerous times we still enjoyed watching the men and women dressed in period costumes working with tools made in the blacksmiths shop. 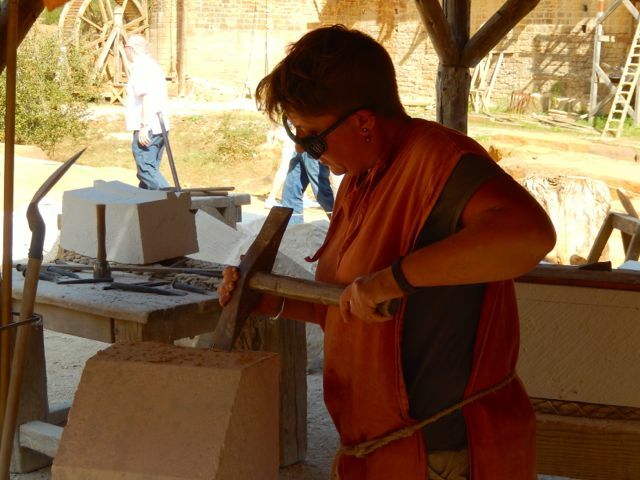 One young woman shaping a piece of stone said it takes her three weeks to do a complex shape where as something more simple might only take… three days! 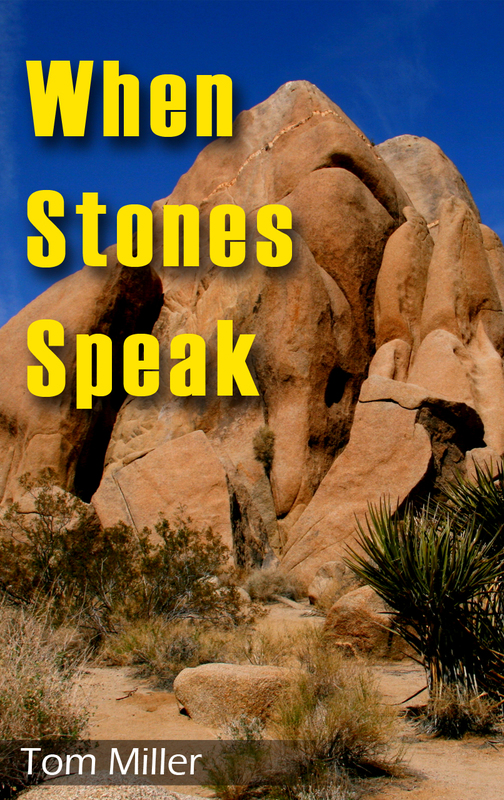 How would you like to spend three days hammering on the same stone? 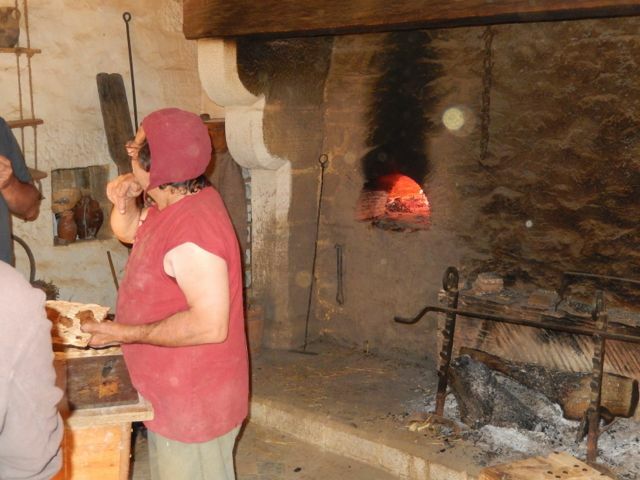 Baking the best bread ever at Guedelon. 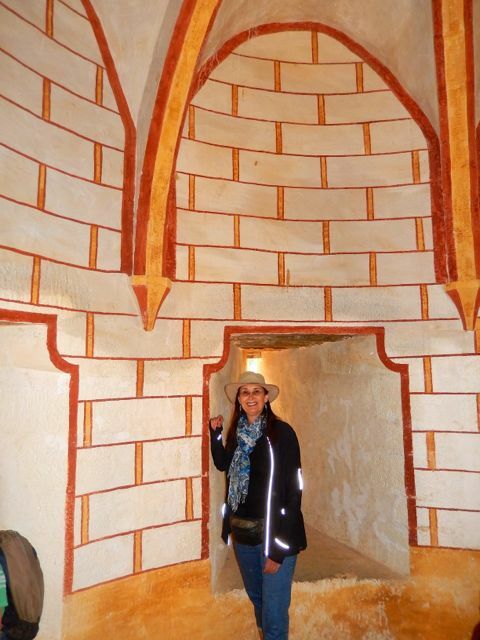 Lisa in a finished room at Guedelon. I ran back to see what the problem was even though I already knew. There are eight wires connected to a hydraulic ram that raise and lowers the roof. 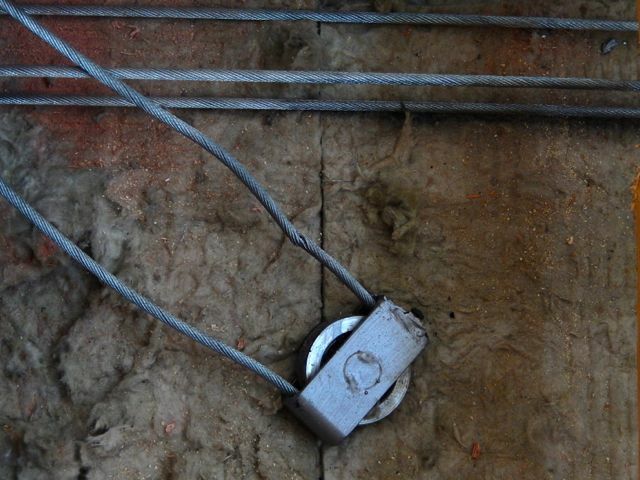 The wires at the aft end of the roof are under the most load, and one had obviously broken. Our hydraulic roof had been made in Holland. To get a factory representative would take time and a lot of money. To make a long story short it was actually a pulley that had a bad weld that came undone. When the pulley broke the added load broke a second wire. We needed to get two wires replaced and the pulley re-welded. Once again Julian came to our rescue. After making numerous phone calls he found the right guy. Our man showed up the next day ten minutes early, which was a good sign. While Julian and the mechanic worked on the roof system Neil and Louise treated us to our favorite restaurant Chapeau Rouges (red hat). By the time we got back everything was working perfectly. Rabelo had not been a very good girl. Fortunately Neil and Louise were great guests, and just rolled with everything Rabelo could throw at them.